After recently seeing Video Games Live with my brother I've had a crazy itch to play an old school RPG. I want to play something that I look back on with fond memories or have heard great things about. I'd really like to play something with good music too. I know it's sort of ironic because one of the reasons I'm bored of WoW is the grind. The difference in my mind is that old school RPGs reward grind with story where WoW rewards grind with gear. I absolutely love a good story and that makes the overall feel of the game different. 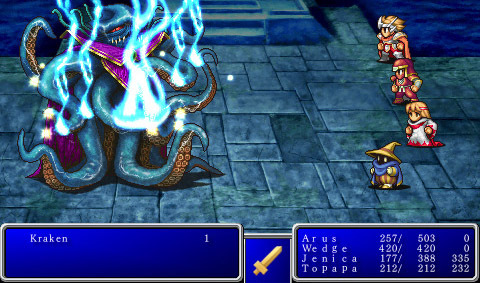 Final Fantasy is tempting because I've always loved FFVII, FFVIII, and FFIX. They are my top 3 Final Fantasy games ever. I've heard fantastic reviews of FFVI but have never actually played it, so that's definitely an option. Two games in my backlog are copies of FFIII and FFVI to play on my DS. FFVI is actually GBA but it'll play on the DS anyway. A few months ago I also impulse bought FFI and FFII on my ipod touch. That's a lot of Final Fantasy to choose from. One of the most memorable RPGs I've ever played. The other option, which I'm really leaning toward, is Chrono Cross. Chrono Cross is right up there with FFVII for my favorite video game music of all time. Just listen to some of the musical pieces in Chrono Cross and you'll be impressed. I've only played through Chrono Cross once, but that music is forever locked in my mind, it's fantastic. I don't particularly want to dig out my copy (somewhere deep in my parent's basement) or my old PS1 (also somewhere in said basement). I wouldn't feel bad grabbing the ROM and playing it on my computer with an Xbox 360 controller because I've already purchased the game in the past. Despite all these choices I think I'm going to end up buying a copy of Chrono Trigger for the DS. It's only $15 on Amazon because the DS version released in 2008. It's a game that I hear about constantly but I've never played more then a few minutes. 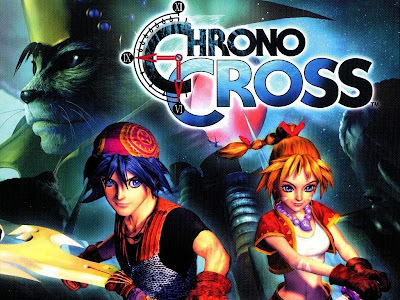 It might deserve my attention since it's the predecessor of Chrono Cross and is supposedly one of Squaresoft's best games ever. So readers, are there any other good old school RPGs out there that are worth my time to investigate? I enjoyed Grandia, but it doesn't really fight in the same weight class as FF7 or Chrono Trigger. The story or the graphics aren't that special, but the combat system and the voice acting are nice. The combat system emphasizes movement and timing much more than Squaresoft games. Chrono Trigger is wonderful - great choice. - Dragon Quest V for the DS is phenomenal, and a stand-out in the series. - The old SNES Lufia games were superb, and the DS just got a release in that series. - I have a soft spot for the old Breath of Fire games.... though a lot of people think I'm doing drugs when I say that. - A lot of people love Persona... I've yet to try those games. True, Grandia is different - but i loved it for that. And you cant do something wrong with Chrono Trigger - worth every penny! I found Megaman Battle Network a very interesting idea. Chrono Trigger is still my favorite RPG, years and dozens of RPGs later. Chross has better music, I think, but both of their soundtracks are always in my playlist. Yasunori Mitsuda is incredible. I've even purchased guitar and piano sheet music for them, even though I don't play... they are my impetus to learn. Oh, and yeah, CC is a great game, too. DQV is great, definitely, and FFVI is fantastic. I just wish they would release Seiken Densetsu 3 in North America already. I just got my DS copy of Chrono Trigger in the mail today, so hopefully I get around to playing it soon! I'm glad you're appreciation for Chrono Cross music is as strong as mine. I still think it's one of the best soundtracks ever. What is Seiken Densetsu 3? I've never heard of it. SD3 is the sequel to Secret of Mana (another good game, along with Secret of Evermore)on the SNES. It's similar to SoM, but has some interesting class-based design choices and a flexible story. I played it via an emulator for a bit before I decided that was a bad idea, but I still love the game and would buy a U.S. release. It's not as good as Chrono, but it's still a high point of the SNES era.